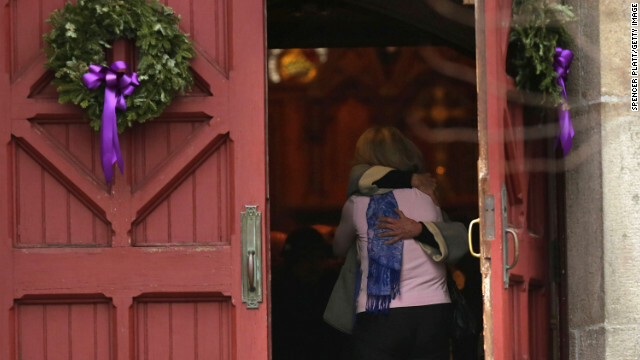 Newtown, Connecticut (CNN)– The bulletins were printed on Thursday for the third Sunday of Advent for Trinity Episcopal Church in Newtown. There was no mention of Friday in the pages' long order for worship. By Sunday morning, the church was hosting its fourth service since the shooting at Sandy Hook Elementary, and the sanctuary had been open for 72 straight hours keeping vigil. A half-empty pallet of tissue boxes greeted church members as they arrived in the front hallway. As the second of the morning's two worship services got underway, people were already quietly weeping in their seats. Young children sat and quietly played or colored next to their parents, unaware of the tragedy around them or that their friend Benjamin Wheeler, a 6-year-old who attended Trinity with his family, was not there. Wheeler was among the 26 people killed at Sandy Hook on Friday when a gunman burst into his elementary school. Pastor Kathleen Adams-Sheperd recounted to the church how she spent Friday at the fire station, waiting with the parents of elementary school children to find out if their child had made it out safely or was among those who did not. "Friday in some part has changed our lives forever," she said in her sermon as she stood in the middle of the congregation, eschewing the pulpit for proximity to her members. Speaking to a crowd still raw and still suffering, she told them of the sermon she had prepared and how it was long gone, asking them to be patient with her as she preached with no notes. On this day, she said, it was "important to be where we are," to be "present with people." She encouraged them to hug one another. "No, really, get up and hug someone," she said. Old and young, visitors and members, embraced tearfully. "Families of our lovely innocent children need our prayers," she said. "Families who survived need our prayers." "I want you to know talking to the ones who have lost, the one spot of joy is that your children are not lost." Adult men from the church were posted at the doors this week, she said, so the children in the service and Sunday schools would know this was a safe place for them. Dressed in purple vestments and wearing a small stud nose ring, Adams-Sheperd walked the church through pieces of the planned Advent service, when Christians light four candles in the four weeks leading up to Christmas to prepare to celebrate the birth of Jesus. "I believe faith will save us," she said. "To loose this faith is to let the darkness win." "Was God absent from our world?" she asked, a burning question on the minds of many in this heartbroken town. "Have we been shaken? Yes. Have we seen hope? Yes, yes, yes." She pointed to the hero teachers who shielded children, administrators from the school who rushed toward the shooter, and the first-responders as evidence of that hope. "So many signs of hope and light in the darkness that seems to envelope us; that's what Advent is," she said. She said she believed the horrific acts were not the will of God. "Where was God? Surrounding all the children. The 430 that made it out, and the 20 that did not." God, she said, "was with them, is with them, and will be with them always. "God will find a way to bring comfort and hope and light. He will wrestle it from the darkness." In the coming days the church will see multiple funerals, including for little Benjamin Wheeler on Thursday and for another classmate, 6-year-old Madeleine Hsu, on Friday. Adams-Sheperd told the church local funeral directors had donated costs of the funeral to the families. Cameras were not permitted to film the worship service but the church welcomed reporters to come and worship. Adams-Shepard explained to the crowd she would not go on camera and talk to reporters because she had given her word to the victim's families, and that what happened in the school is "owned by the parents." She told the congregation if anyone was holding any enmity in their heart it was time to let it go. "I'm done. I love you. Pray, everyone," she said. And with that she turned to prayer and recited the name of each victim. CNN's Jeremy Moorhead contributed to this report. nike nfl jerseys cheap cheap chanel bags chanel purses cheap Seattle Seahawks jerseys For even better views than those on offer in Sorrento, take a drive down the Amalfi Drive while youâ€™re there. This road runs along the Amalfi Coast and offers up breath-taking views over the deep blue Tyrrhenian Sea. Before you leave Sorrento though you should take one of the regular ferries over to the Isle of Capri, where youâ€™ll find many beautiful attractions such as the Villa San Michele, Grotta Azzurra (a sea cave), the Roman ruins of Villa Jovis and the Certosa di San Giacomo monastery. new nfl jerseys chanel outlet Tanzanite: healing properties Speaking about tanzanite healing properties, in the first place must be said about its beneficial effects on on human sight. If for some time concentrated and relaxed look at tanzanite stone, the eye stress will be removed. Some people believe that blue tanzanite promotes recovery from colds, relieves fever. Tanzanite is used in treating skin and spine diseases. Tanzanite has a positive effect on frontal chakra. The True God requires and helps those needing recovery to go the "way" that has the greatest "truth" and greatest value to "life" – the intent and purpose of the law. The False God wants games, contests, conflict, and war which leads to the way of "Leviticus 26", "Mathew 24", "7 Seals", and "The Book of Enoch" where the one who imitates God will have his angels melt. This is evident in the lack of planning to avoid the economic crisis that will cause the problems listed in "Leviticus 26". The word translated "tares" in the King James Version is ζιζάνια (zizania), plural of ζιζάνιον (zizanion). This word is thought to mean darnel (Lolium temulentum), a ryegrass which looks much like wheat in its early stages of growth. Roman law prohibited sowing darnel among the wheat of an enemy, suggesting that the scenario presented here is realistic. Why would so many people on this blog, especially the militant atheists, mock the faithful of Newton while they grieve for their children and loved-ones? As far as I know, some of them aren't even in the ground yet. This is not rational, helpful, or kind behavior. I would answer that, but then I would be a "hater". Bwain, what color of glasses is your god wearing today? And what color are you wearing?